I'll keep this short. 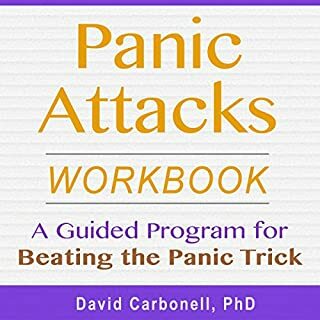 Dr. Carbonell combines simplicity, supreme topic depth, a bit of humor, and peaceful delivery (ebook) to specifically cover panic disorder. I would say I am in the mild-to-moderate range and have been dealing with panic for 4 years now. I've tried multiple GP's, a Neurologist, Psychologists, Psychiatrists, healers, acupuncturists, and other healers and can say this ebook tops them all. Healing starts with truly understanding what you are dealing with and taking personal steps to reverse the disorder rather than seek external remedies. Dr. C is an unbiased expert, and his material I could relate to at close to 100% (first time I can say that). I only wish I could have found this book years ago and saved almost $5k in med bills.